This guest post was written by our October featured sponsor, Paige Ronchetti of Oh Nostalgia. Anyway, let's get moving with this jewelry holder! 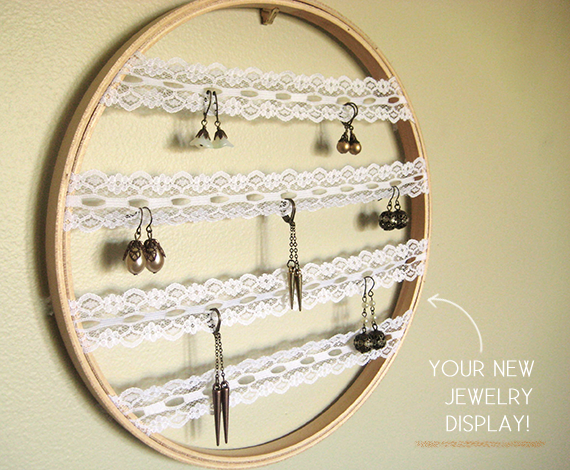 I use mine for earrings, but depending on how sturdy your lace is, you could also hang bracelets and necklaces from it. You can hang it on a wall, lean it against something, or even use a wooden plate holder or easel to hold it up. This is literally one of the easiest things I've ever made, and I love me some easy projects. First, unspool some of the ribbon and cut a few strands to size. I left a little extra on each end for adjusting once the hoop is in place. 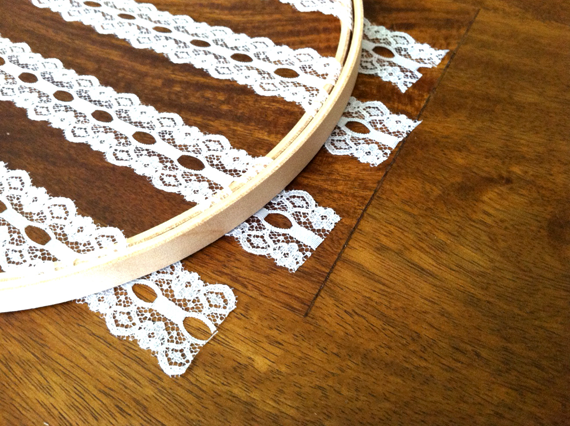 Pull on both sides of the lace gently to adjust and tighten. 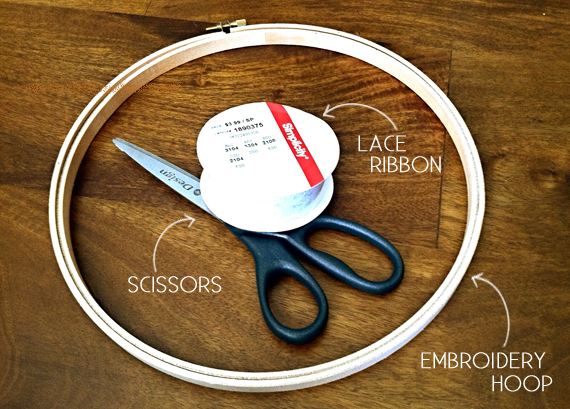 Once you have the ribbon equally spaced and level, tighten the embroidery hoop by using the screw at the top. Adjust the lace as you go, if necessary. Once everything is in place, snip off the extra ribbon. 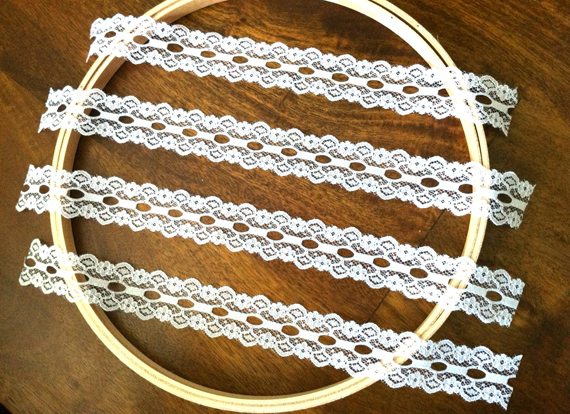 You may find that a thinner lace doesn't "fill" the space between the hoops, even when the screw is tightened all the way. If this happens to you, just dab a bit of glue on the back where the lace peeks out. This will keep it in place. And that's it! See, the easiest project ever. 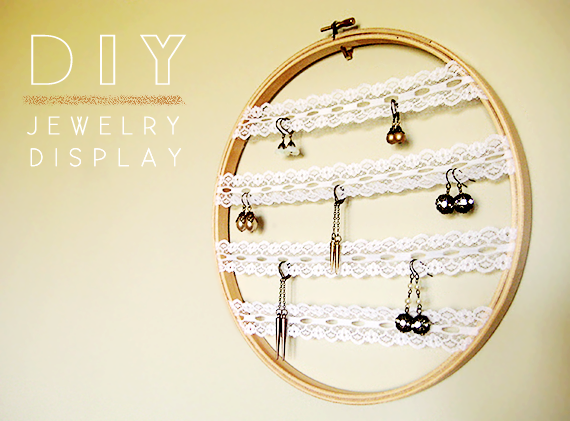 Honestly, it took me way longer to take the pictures for this post than it did to make the actual jewelry holder. Such a simple but beautiful idea! I may have to give this a whirl and see if I can make it look as pretty! This is too cute and I love how easy it is! What a sweet and super easy DIY, love it! Cute and simple! I'm a box person. My husband stained my box for me. This is such a fun, simple idea! Thanks for sharing. I can't wait to try this! My jewelry is in a shoebox right now! Oh I love this! I have so much jewelry and never know where to store it all.